Short and to the point for this post….Once again the future of Chelsea FC is at a crossroads. With one of the most anticlimactic managerial appointments in recent memory wrapping up today, Carlo Ancelotti takes the helm at Chelsea. As a long time supporter of Chelsea I have mixed feeling about this announcement. First on the positive side, Carlo’s European pedigree is first rate. Taking any club to three Champions League finals is no small task, and his ability to build cohesive teams with diverse world backgrounds is with out question. I’m particularly happy that the Chelsea hierarchy moved quickly and with great purpose to get Ancelotti on board as quickly as possible. With the news coming only two days after the FA Cup final (I almost called that score line in my previous post….anybody think goal line technology isn’t a must in football anymore?) maximum time is now given to Ancelotti to begin his squad shaping. Minimal moves are required really (let’s just assume right now Deco and Carvalho end up at Inter shall we? ), the squad is strong up top, and has one of the fiercest center midfield’s in the world. Our back-line was tied for fewest goals conceded in the Premier league which suggests the continued partnership of Alex and Terry will be fine, the emergence of Branislav Ivanovicwas also a nice development towards the second half of the season. The immediate focus for Carlo should be addressing an attacking wing position; Malouda, Cole, and Kalou are solid pieces but a world class winger preferably with a strong left foot would be an ideal addition. As for the negative side of this hire? Didn’t we just go down this road with a foreign coach less then a year ago? Who also lacked strong English skills and came from a completely different background of football? I know all about the argument of the differences of national team management compared to that of club, and how the comparisons between Scolari and Ancelotti really shouldn’t be drawn…..but I don’t care, this hire seems a tad to close to same mold and style of coach for me to be comfortable with. Marcel Desailly one of the legends of Chelsea is on record as early as last week voicing his concern on the potential hire that now has become reality. How quickly will Ancelotti adapt to the massive differences of Premier League play? How will he build a flowing brand of football that Roman Abramovich demands? Anybody who’s watched an AC Milan match quickly recognizes a methodical, build up style of soccer that may not be ideal for the fast paced, end to end action of English football. 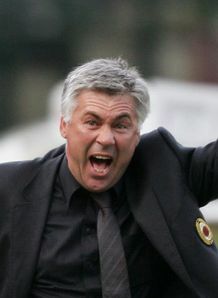 Which brings me to Ancelotti’s domestic league record. In eight years at AC Milan he can only point to one league title? With several second place and third place showings maybe this isn’t a huge deal, but is worth noting as a possible concern. The Chelsea nation will be eagerly awaiting the launch of the World Football Challenge in July. Only questions and conjecture are left to ponder, as once again, Chelsea have a new face at The Bridge trying there hand at living up to the lasting impression of “The Special One” who still looms large. With Hiddinks recent successes, that task maybe impossible. This entry was posted on Monday, June 1st, 2009 at 11:33 am	and tagged with carlo ancelotti, Chelsea FC, soccer and posted in Sports. You can follow any responses to this entry through the RSS 2.0 feed. Another disappointing season, Chelsea is living up to the Yankees of the EPL. With aging players and no great young prospects they look like they will be in the same position next year.